Ambassador Singh addressing an audience of over 400 at the community reception hosted by the Indian associations of Georgia. 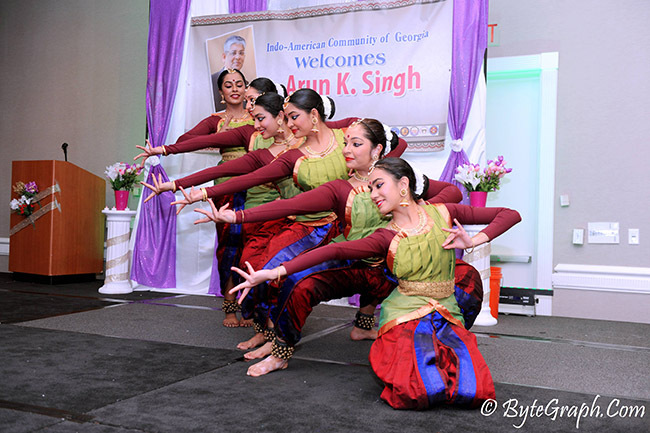 Atlanta, GA: As Indian government’s highest-ranking official to the United States, Ambassador Arun Kumar Singh’s visit to Atlanta was met with enthusiasm and sold-out public events. Appointed by Prime Minister Modi less than a year earlier, Singh is touring cities – meeting with local political and business leaders – to massage and grow the economic ties between the United States and India. In Atlanta on February 24-25, Singh visited with Georgia Governor Nathan Deal, Atlanta Mayor Kasim Reed, amongst other notable business and community leaders to capitalize on India’s massive opportunities as one of the world’s fastest growing economic markets. When asked about US –India trade relations, Singh said it was during President Clinton’s official visit to India in 2000 that set the roadmap for strengthened cooperation. He continued, “President Obama’s two official visits have expanded relations for sure. It has advanced our trade relationship, defense relations and set the mutual progressive tone that follows us today.” In this modern-day, hotly-contested Presidential race, it is a good thing India enjoys bi-partisan support across Congressional aisles especially since the United States is India’s biggest trading partner. Currently, trade is about $120 billion but money is flowing both ways. While India is becoming a key market for US-based companies, Indian companies have invested $15 billion in the US, creating 100k direct new jobs, Singh commented. Students of Bharat Kala Natya Academy performing at the reception. Singh, who previously was the Deputy Chief of Mission in the Indian Embassy in Washington DC as well as Ambassador of India to France, noted that defense cooperation between the two nations is rising reflecting the “growing confidence between India and US”, Singh added. Over the past five years,India has procured nearly $14 billion of US defense supplies. While visiting Atlanta last week, Ambassador Singh stopped by Lockheed-Martin Corporation, which makes C130 aircrafts, in which 12 airplanes have been made or are being made for India. There is also exploration of co-developing new jet engine technology and co-producing defense equipment. There is also a seismic upward trend in financing India-based startups. “In the last two years, $6 billion dollars have flowed into startups in India,” Singh said. Innovation within startups and digital technology is creating new opportunities within US –India trade relations.India’s millennial population is large with current demographic population data showing 65% is under age 35, making it a hotbed for young people to become entrepreneurs. Singh noted Qualcomm’s recent announcement to invest $150 million in support of India government’s Digital India and Make-in-India initiatives as a prime example of the partnership between US –India startups and innovation. Singh pointed out that the people to people dimension is another component that solidifies the US–India trade relations. There are 3 ½ million people of Indian origin based in the US with large sectors represented in the medical and hospitality industries, making it one of the centerpieces in US – India strategic partnership. 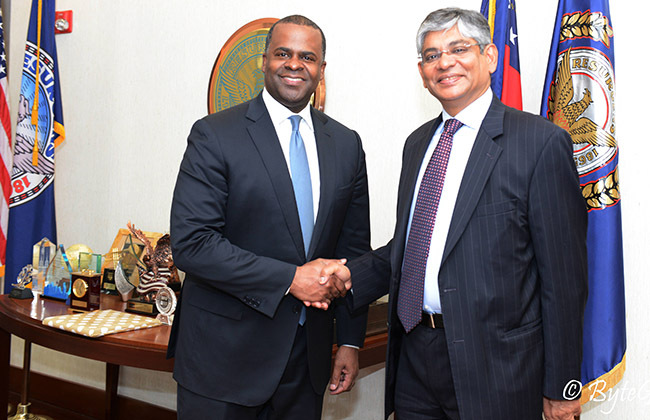 Ambassador Arun K. Singh with Atlanta Mayor Kasim Reed. During Singh’s visit, he was the guest of honor at a community organized reception at Westin Perimeter. Consul General of Atlanta, Nagesh Singh gave the introductory remarks reminding the 400 audience members that both he and Ambassador Singh served together in the Ministry but they were not long-lost cousins as someone in the audience suggested. Ambassador Singh commented that US –India relations are strong and there are many areas to further expand their partnership. “There are many unmet needs in India and there will be a focus on railway modernization, infrastructure, expansion of manufacturing and startups,” Singh remarked. Part of the changes includes a high-speed train between two industrious Indian cities – Ahmedabad and Mumbai. This is just one of the changes which exemplify the strong US –India partnership. GIACC, bursting the charts in 2014!